Two yachts are towed in. Weather : Wind F5/6 SW with a big sea running. A 35ft yacht ‘Moon Tiger,’ had gone to the assistance of a second 35ft yacht named ‘Third Wave’ which had engine trouble. ‘Moon Tiger’ started to tow her towards safe harbour but experienced difficulties herself. Selsey all-weather lifeboat was called out and took both yachts in tow but found in the weather conditions, that the second yacht in the tow line was shearing about and the tow was in danger of breaking. Hayling Lifeboat was therefore asked to assist, took over the tow and brought ‘Third Wave’ into Chichester Harbour and Selsey Lifeboat towed in the other yacht. Both yachts were taken to Sparkes Marina and then the lifeboats returned to their respective stations. Fishing boat is swamped by waves. Weather : Quite rough with a F5 WSW wind. The commercial fishing boat ‘Horizon’ had finished fishing and was running downwind at the W end of Hayling Bay. Based in Portsmouth the skipper turned into the wind and waves to make for his home port. A big rogue wave caught the catamaran and broke over the bow filling a large plastic holding tank situated on the forward deck. This caused the boat to be bow down and so more waves started to break over the deck causing the skipper to turn back so she went downwind and with the waves. The boat was still bow heavy however and waves came in over the starboard side where there was little freeboard and began to get below into the starboard hull. A MAYDAY call was made for assistance and both Portsmouth and Hayling Inshore Lifeboats were launched, and the S&R Helicopter was paged. The lifeboats reached the casualty at the same time and both put crewmembers on board with salvage pumps. Once the pumps were running and emptying some of the water the boat became more manageable and was able to proceed into Chichester Harbour escorted by the lifebaots. The helicopter, now not needed returned to base. ‘Horizon’ was taken into Sparkes Marina where the pumping out was completed and then the lifeboats returned to their stations. ‘All Spice’ towed by the lifeboat. Joint skippers Hugh Thomas and Jason Williams with their wives, Hugh’s daughter aged 12 and dog ‘Monty Musto,’ went to enjoy taking part in the New Years Eve celebrations in Cowes, but on their return on New Years Day suffered an overheating engine off Chichester Harbour entrance. The group left their mooring in Itchenor in fine but breezy conditions and sailed their Moody 29 yacht ‘All Spice’ over to the Isle of Wight without incident. They had a good evening seeing in the New Year and then on New Years Day set out in a fresh SW wind to sail back to Itchenor. There were some rough seas off Langstone Harbour and again as they approached Chichester Bar Beacon so the skippers decided to start the inboard engine to give the boat stability for the harbour entrance. All went well for a while and then smoke/steam began issuing from the engine compartment and filling the cabin. They immediately made a Mayday call to the Coastguards having had to turn the engine off and the boat was then left in the moderately rough seas without momentum. The Hayling Island RNLI Atlantic 85 lifeboat was launched and reached the casualty vessel together with the Hayling Rescue rib. Lifeboat crew went aboard and the crew of ‘All Spice’ including ‘Monty Musto’ were taken off into Hayling Rescue vessel and transferred to the lifeboat station, whilst the RNLI crew assessed the possible fire situation. A tow was established and the Fire & Rescue Service paged to meet the vessel off the Lifeboat Station. Once ashore at the station the crew were able to relax and keep warm whilst the lifeboat team and the Fire & Recue team confirmed that the ‘fire’ was out and that it was safe to take the yacht to Sparkes Marina where a further more detailed inspection took place. It was found that a raw water inlet hose had sheared off and the exhaust system was then over heating as well as the engine causing the smoke and steam in the cabin. Mrs Rena Williams who was inside the cabin when the engine was overheating and was greatly concerned by the incident said ‘ It was pure relief to see the rescue boats arriving with us in quite rough conditions. I want to express our gratitude to the RNLI and Hayling Rescue for their prompt action.’ ‘Monty Musto’ seemed more concerned with the biscuits at the lifeboat station however! 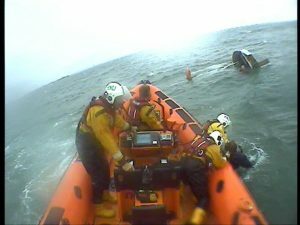 Windsurfer rescued in cold conditions. The Coastguard requested we launch to go to assist a windsurfer in trouble off Hayling Seafront. The Atlantic 85 was on scene in 4 minutes and found a 63 year local windsurfer who had been caught out by changing weather, with a NW wind getting up to force 6. He had done all the right things and was well equipped but got tired and cold and was not making it back against the wind. We took him on board, wrapped him in blankets and a survival bag and quickly got back to the station. After a period warming up and recovering he was declared fit by RNLI crew and ambulance personnel and so his wife took him home. He said later ‘I am thoroughly grateful to you guys for rescuing me. I seemed to have been in the water for ages.’ We too are very glad he was OK as with a sea temperature of 7.5 degrees C you must not stay in tehwe ater for too long. Night fishermen drifting out to sea. The Coastguard, responding to a 999 call from two fishermen, asked us to go to their assistance about half a mile South of Eastoke Point. The D-Class lifeboat was launched and found the two men by the Bar Beacon in a 2.4m inflatable with no engine but a set of oars. They explained that they had tried to anchor but had lost the anchor as it was not secured to the boat! They were not making headway back into the harbour using the oars, as they were against the wind and an ebbing tide. The two fishermen were transferred to the lifeboat and the inflatable taken in tow back to the lifeboat station where the two men were met by the local Coastguards. Both lifeboats were launched responding to a request for help from the Coastguards in searching for a man who had disappeared and was threatening self-harm. He had last been seen near the Creek Road Car Park and was heading east along the shore. The D-Class searched close to the shore and the Atlantic 85 a little way offshore starting at Eastoke Point. Four other crew members walked from the Lifeboat Station round the point and along the shore as far as Creek Road. The D-Class put a crew member ashore to talk to two fishermen by the Coastguard lookout, who said they had seen a person matching the description of the man, but that he had been walking west towards the funfair, so the two lifeboats continued as far as the ‘Inn on the Beach.’ Not finding anyone they then reversed course and continued round the point to just off the Lifeboat Station. As no-one had been found both lifeboats were then released from service. Weather : Light Southerly F3 wind but cold and with heavy rain. Local windsurfer Sean Boyle from Hilsea was windsurfing in Langstone Harbour on Saturday Nov 22 and according to his friend and other windsurfers he was looking forward to enjoying his favourite pastime. UK Coastguard requested we launch as they had a reported serious incident. The D-Class was launched and went to Hayling Bridge but was then re-directed to the area in Langstone Harbour behind the Esso Garage, a popular bay and safe for windsurfing. The Atlantic 85 was also launched to back up the D-Class and they discovered that Portsmouth Lifeboat had also been launched and all arrived on the scene together. A sailing dinghy crew had spotted a windsurfer rig floating in the water with no-one around but shortly after this discovered a body face down in the water. They managed to get the body on board their dinghy, raised the alarm and took him ashore. Hayling First Responders were rapidly on scene and an Ambulance crew arrived and together they tried to resuscitate the casualty. The Coastguard Helicopter was paged as it was clear the situation was very serious. Mr Boyle was taken by helicopter to QA Hospital but sadly was declared dead on arrival, possibly from a cardiac arrest. The Hayling Lifeboats recovered the windsurfing rig and handed it over to the Police on the scence. Both local windsurfers and the RNLI crews have expressed their shock and sadness that this incident has claimed the life of a seemingly fit and healthy 53yr old local man. Three men out of their boat! UK Coastguard called and asked us to investigate a report of 3 men in the water from a capsized tender, in the vicinity of Northney Marina. The Atlantic 85 was launched and arrived at the scene of the incident to find that two of the men had swum ashore but that the third was missing. The Harbour Patrol vessel had also been paged and they were in the area and found the missing man in a moored boat in Girt Rythe. The lifeboat crew were asked to check the medical condition of the men. They started with the man in the Harbour patrol vessel and then put two crew ashore to review the condition of the other two. All were declared fit and well. The lifeboat then recovered their tender and took it ashore and the three men returned home to Southampton. Weather : Calm but dark with a NE F2 wind. Red flares were reported by a fishing boat entering Chichester Harbour and several members of the public. They were reported as being at the top of the Thorney Channel. Both lifeboats were launched with the Atlantic going to search up Thorney Channel and the D-Class searching up Emsworth Channel. Although the weather was clear and a bright moon came out it rpoved necessary for the Atlantic crew to let off two white parachute flares to search the shallower water to the east side of Thorney Channel. The Coastguard helicopter joined the search covering both channels and the East Head area but nothing was found found by any of the rescuers. With many bonfires and fireworks being let off to the north of both channels it was decided that these had been mistaken for red flares, unless of course they had been red flares used as part of a private bonfire party?? Solent Coastguard had a report of a dinghy capsizing frequently just offshore in Bracklesham Bay. The Atlantic 85 was launched and arrived at the bay ten minutes later. They spotted the Laser dinghy on the beach and so two crewmembers went ashore and met the 4 teenage sailors. They explained that they had been practicing capsize drill and that they were all OK. Although cold they were not injured and so the lifeboat returned to the station. Weather : Getting dark and raining with a NE F7 wind. The Coastguard asked us to go to assist a 21 foot open dayboat with engine trouble, some 2 miles west of the Chichester Bar Beacon. The skipper had just purchased the boat from an elderly gentleman in Littlehampton but he didn’t have much boating experience. He nevertheless set out to travel to Southsea Marina in challenging weather having been told by the previous owner that there was sufficent fuel in the engine and spare fuel cans to get to Southsea. When in a position off Hayling the engine cut out and he found it had run out of fuel. He found the spare cans but they were empty as well leaving him powerless. Fortunately he had both GPS and a VHF radio so he called the coastguards and due to the increasing wind and tide was told to anchor. He had to admit he did not know how to do this! The lifeboat was launched but he was drifting rapidly. Using the radio DF kit and a chartplotter the lifeboat was however able to locate the casualty and put a crew member on board. A tow was established to take the casualty out of the danger of rolling over in choppy sea on the East Winner Bank, or of even worse drifting into the Shipping Channel with the possibility of being run down. Once safely into Langstone Harbour the vessel was taken to Southsea Marina and made secure, with a very grateful skipper on board, having had a very eventful and risky maiden voyage. Weather : Fine and dry with a F3 SW wind. After a day when the Kite Surfing Armada had nearly broken the record for the largest number of kitesurfers to travel a measured mile, some of the participants were making use of the F3 wind having had to wait all day for it to appear. A report was received of two kitesurfers in difficulties off the Coastguard Station in Hayling Bay. Once launched however the lifeboat was re-directed to a new position East of the harbour mouth. Within a short time however a report was received that the two kitesurfers had made it safely ashore so the lifeboat returned to the station. A kitesurfer got into difficulties off the beach near the funfair and lost contact with his rig, which drifted away. By the time that lifeboat reached Hayling Bay the surfer had made it ashore but his rig was recovered opposite the Coastguard Station and taken back to the Lifeboat Station. The kitesurfer collected his rig and expressed his thanks to the lifeboat crew. Dinghy capsizes due to waves and shifting wind. Weather : At first fine but breezy with a F5 SW wind, but veering to NW F5 and with heavy rain. The owner of an immaculate wooden GP14 dinghy, kept in the Bosham Boat Pound, travelled down to sail it with a friend. They set out in fine but breezy weather and made their way down Chichester Harbour to the entrance. So far so good. They then decided to venture out of the harbour and didn’t take account of the strong SW wind over a rapidly ebbing tide, which had produced a lumpy sea off the harbour mouth. As they sailed into this area the wind suddenly veered to NW and gusts increased under a weather front which produced heavy rain. The GP14 came off a wave and the wind caught it breaking the boom. Immediately the mainsail billowed and the boat capsized. The crew tried to right the boat but with a sail now full of water they snapped the centreboard. Luckily the skipper had had the foresight to bring a waterproof VHF radio and he made a Mayday call for help. The Altantic 85 was paged by the Coastguard, launched within 7 minutes of the call and reached the casualties in 4 minutes. The GP14 was being pounded by the waves as she lay on her side. One casualty stated he felt unwell having swallowed sea water and so he was taken aboard the lifeboat (pictured being pulled into the lifeboat) and transferred to the lifeboat station. Colin Parke, crewmember, was left on the scene in a Hayling Island Sailing Club rib, and Colin was able to right the dinghy with the second casualty aboard. Although the Atlantic 85 returned quickly, the second casualty was now very cold and suffering from Hypothermia and not at all well. He was quickly taken ashore by the HISC rib where the station paramedic and then Ambulance personnel gave him attention including the use of oxygen as his breathing was very erratic. The Atlantic then with Colin aboard, organised a tow for the dinghy having to cut some of its rigging in order to take the damaged mast out and stow it on board. The tow was undertaken in a considerable sea so that as Colin commented ‘It was pretty rough so that when a wave overtook me I lost sight of the lifeboat until I rode the next wave!’ Both casualties recovered quite quickly and were declared ‘fit and well’ by the ambulance crew. Both expressed their deep gratitude to all the services concerned for their rescue. The GP14 dinghy was carried into the lifeboat station and was collected later by the skipper. Three men and a dog rescued. Solent Coastguard received a mobile phone call from a power boat that reported it had equipment failure, so he asked the D-Class to divert from its training exercise to assist. 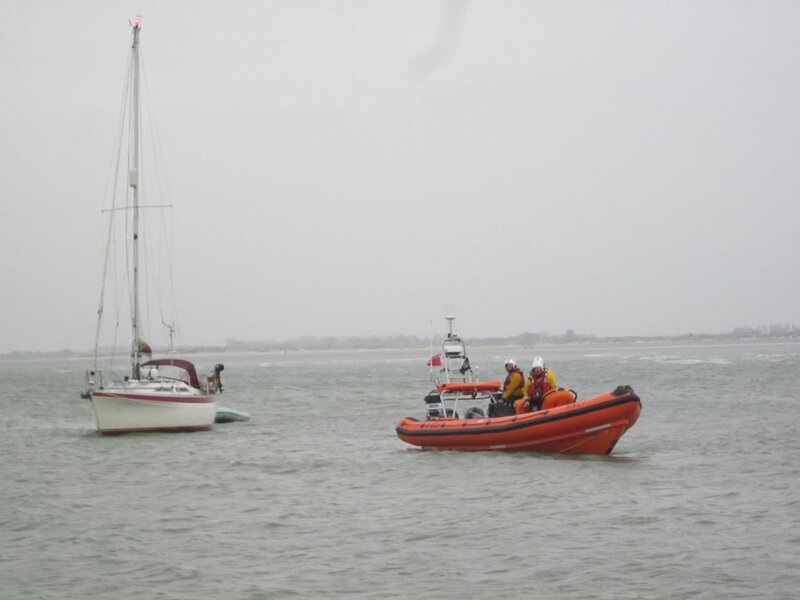 A second call from the power boat stated that the skipper ‘thought they could be near the Chichester Harbour Entrance.’ Owing to the weather conditions in the harbour mouth, the Coastguard then asked the Atlantic 85 to divert and assist. Once at the Chichester Harbour Entrance no vessel in trouble could be seen and since the casualty had no radio it could not be found using direction finding equipment. So a search was instigated involving both lifeboats and after a third telephone call which suggested they were SW of the Bar Beacon they were found, clearly waving a bright orange fender for help and being ignored by passing yachts! There were 3 on board + a dog and they were very sensibly all wearing lifejackets including the dog. The D-Class rigged a tow and took them into Sparkes Marina where it was discovered that the starter motor had failed. They were then fortunately able to get a tow home to Itchenor from a friend in another vessel. Bembridge Lifeboat had been called out to assist a yacht to the SE of the Isle of Wight, which had got fishermans ropes/lines caught in its propeller. It was agreed that Hayling Lifeboat would meet at the Chichester Bar Beacon and take over the tow. The two lifeboats met at 00:55 and the tow was passed to the Atlantic 85 who towed the yacht into Sparkes Marina. Once the crew had been checked and found to be OK the lifeboat returned to the station so that everyone could go back to bed! Solent Coastguard asked us to go to assist a sports boat with engine failure in Hayling Bay. The boat was being washed towards the shore and had 4 people on board. The Atlantic 85 was launched and went to the area just off the Coastguard Look-out Station where they found the casualty. The boat was very close inshore and a local coastguard had entered the water and was holding the boat to prevent it being damaged in the breaking waves. A tow line was passed to the boat and she was towed into deeper water where two of the crew were taken aboard the lifeboat, leaving two crew plus a lifeboat crew member on the sports boat. The boat was towed to Sparkes Marina where she was given contact numbers for the Harbour Patrol and Hayling Rescue to arrange a tow back to Itchenor. The station picked up a radio distress call from a commercial fishing boat ‘Sarah C’ who had radioed the Solent Coastguard reporting an overheated engine and a water leak into the hull. The vessel had advised the Lifeboat Station the day before that they would be active placing fishing nets in the area to the south of the Outer Wreck off Chichester Harbour entrance. The Atlantic 85 had just returned from an assessment exercise and the crew were still kitted out and it was agreed that the lifeboat should re-launch and take a salvage pump to the fishing boat. The lifeboat assessed the situation and set the pump to remove the water which had come in and towed the boat towards its home port of Emsworth. On reaching the boats mooring they then stayed with the casualty as water was still leaking in. Once fixed ‘Sarah C’s’ skipper returned to shore and the lifeboat was stood down. Expensive yacht holed in a T-bone collision. Boat launched : Atlantic 85. Weather : Fine and with a slight sea but a F4/5 W wind. Holed yacht coming into harbour. August ended with an accident that left a couple leaving for a two week cruise devastated. A very smart 40ft Hallberg-Rassy yacht had just left Chichester Harbour under sail and was on starboard tack. Therefore they had the right of way. A yacht on a collision course with her and on port tack probably thought they could pass ahead of the Hallberg-Rassy. They misjudged it and ploughed into her port bow making a sizeable hole, fortunately above the water line. They immediately accepted responsibility for the damage done. The couple on the holed yacht called for assistance and the lifeboat crew were quickly on scene. A crew member went aboard to check how much water had come into the yacht. As they motored back towards the harbour nothing further was coming in through the hole, so the lifeboat escorted them (see picture) into Sparkes Marina where they could take stock and make calls to their insurance company! Sadly their holiday was ruined. All skippers need to always take avoiding action clearly and safely when they do not have the right of way and they are closing on a collision course with another vessel. Weather : Fine but with a sharp F4 NW wind. In the first of two overlapping incidents the Atlantic 85 was launched to go to assist an open 14ft motor boat with three crew on board, two of whom were teenagers. The boat had a problem with its outboard engine. The boat was taken in tow and returned to its base up the Thorney Channel. Whilst the first service was taking place we received a request from Solent Coastguard to go to a broken down jet-ski in Hayling Bay. The D-class lifeboat was launched and soon found the jet-ski witih a broken down engine. The crew took the man on board ashore so he could go and get his trailer. The jet-ski was then towed round to just off the lifeboat station and anchored pending the owner arriving with his transport and trailer to take the stricken jet-ski home. Express Dinghy stuck in the mud. Responding to a report of an upturned dinghy in Mill Rythe Creek close to the holiday camp, the Atlantic 85 was launched. Solent Coastguard had informed us that the dinghy helm was in the water but could not right the boat. Arriving at the scene the crew found that the dinghy had its mast stuck in the mud at the bottom of the creek, and the daggerboard had snapped. With the assistance of the lifeboat crew the boat was righted and the helm and boat were taken to the launching slip at Hayling Yacht Company, from where the dinghy had started out. Once the crew had checked that the helm was alright the lifeboat returned to the station. Weather : Fine but with a SSW F5 wind and ebbing tide. In the first of 4 incidents, crew at the lifeboat station saw a dinghy sailing over the Winner Bank which then went about about and took down its mainsail. Its crew started waving for help. The D-class lifeboat was launched and went to the dinghy who requested a tow back to Itchenor, so a tow was established but Chichester Harbour Patrol vessel was contacted and the tow passed to them near the Rookwood Buoy. On their way back to the station the D-Class was sent to two further dinghies that were on the Wittering side of the Winner Bank and had already capsized several times. They were being carried out on the strong ebb tide towards the rougher seas over the East Pole Sands. As one of the dinghies crew had been in the water for some time, the Atlantic 85, returning from an event at Emsworth, was diverted to assist. The D-Class reached the first of the dinghies and assisted in righting the boat, then with the assistance of the Atlantic crew they righted the other dinghy. Both helms had been in the water and were cold and tired so they were taken into the Atlantic and wrapped up to keep warm whilst the D-Class took the two dinghies in tow. Both casualties and their dinghies were landed at Itchenor Sailing Club and handed over to club personnel. Before reaching the station however the Atlantic 85 was tasked to go and search for a catamaran which had capsized in Hayling Bay and was not being righted. After a short delay in finding the casualty the lifeboat crew identified a small catamaran, now upright and sailing, who confirmed that he had capsized and had taken a while to right it. He was escorted into Langstone Harbour and helped ashore. Finally both lifeboats were back at the station and had been made ready for their next incident! Three men in a boat apparently lost? Weather : Clear but getting dark with F2 North wind. A report was received from a concerned relative that three family members, a young man of 20 and two boys aged 11, had taken a small motorboat from their driveway at about 15:00, towed by a car, but had not returned and it was now getting dark. Both Hayling Lifeboats were launched as well as Portsmouth Lifeboats to search Chichester Harbour, Langstone Harbour, and the shorelines of both Hayling and Southsea. Within a short while after searching up to Emsworth and starting to search the Warblington shoreline the Police informed us that the car had been found at Brockhampton Quay and a report that the 3 missing crew were at a location in Southsea. All units continued to search for the boat and crew until the Police confirmed that they had found all three safe and well in Southsea. So a family jaunt ended well but caused considerable worry for the relatives. The day started with a ‘Mayday’ call from a yacht on E Pole Sands, reporting that the boat had gone aground and lost steering when she hit the bank. The Atlantic was launched and the D-Class diverted from an exercise to go and assist. The Atlantic stood off the boat in deeper water whilst the D-Class passed a tow to them and the Atlantic pulled them off. They had however broken the rudder and so the D-Class fetched a drogue to slow the boat when under tow and with a following wind over Chichester Bar. This was set and the casualty towed into the harbour and to Sparkes marina. Mid afternoon a call from the Wittering Lifeguards was for a 5year old boy lost at W Wittering and last seen near groyne 18. The D-Class was launched and started a search along the beach with a crew member in the waters edge. Shortly however the child was found by a police unit 2 miles away in Shore Road so the lifeboat returned to the station. At just before 5 o’clock a call was made from the Solent Coastguards about an open boat just to the East of Rookwood Buoy which appeared to have a fire on board. The Atlantic 85 was quickly on scene together with the Harbour Patrol vessel but the fire was apparently out and so the Harbour Patrol vessel took it in tow for Bosham, where it was arranged to have the Fire and Rescue Service meet them and check the casualty over. Solent Coastguard requested assistance for a motor boat ‘Wave Hawk’ who had suffered engine failure out by West Pole mark, when a wave had come over the stern of the boat, swamping the 110HP outboard. Although they had set an anchor the ebbing tide was too strong and they were not holding the ground. The Atlantic 85 soon reached them, set a tow and took them back to safe haven in Sparkes Marina. Crew spot a boat in trouble. At the end of a busy ‘Open Day’ crew members saw a power boat drifting out on the tide past the lifeboat station. After travelling some way the boat was seen to anchor but did not seem to be making any attempt to call for help. Eventually a passing rib was hailed and went over to the casualty but then after a brief conversation went on its way. As the rib passed the station it was hailed and asked what the problem was. They explained that the motor boat had broken down and that they (the ribs crew) were going to alert HISC. Solent Coastguard were called and the Atlantic 85 was launched as there were several children on board. One child felt unwell but recovered quickly and so the casualty was taken in tow and returned to Sparkes Marina. Two species of ‘Moth’ involved! Solent Coastguard asked for a launch to assist a 19ft gaff rigged Cape Cutter with engine failure in Hayling Bay. The Atlantic 85 went to help whilst at the same time several sailors from the Moth Class Association had come to present a £500 cheque to the Lifeboat Station for assisting with rescues (see earlier reports) of ‘Moth ‘Class dinghies. The Atlantic 85 reached the casualty vessel to find, in an amazing co-incidence, that she was called ‘Moth! !’ A motor vessel called ‘Sulis’ had given ‘Moth’ a tow but asked the lifeboat helm to take this over and so the Atlantic 85 did so and towed ‘Moth’ into Sparkes Marina. ‘Sunny Spell’ on fire ? The Atlantic 85 was launched in response to a ‘PAN PAN’ distress call from a small open motor boat called ‘Sunny Spell.’ Solent Coastguard requested the launch as the motor boat had reported a suspected fire, but further discussions between the skipper and the Coastguard decided it would not be necessary to call out the Fire & Rescue Service. The Atlantic 85 reached ‘Sunny Spell’ and released a motor boat and a safety boat from the Moth World Championships that were standing by in case they were needed. The lifeboat helm went on board and together with the skipper looked inside the engine compartment. They found that a cooling hose had come adrift, spraying sea water all over the engine and ‘cooking’ the HT and 12V electrical leads. It was decided to carefully tow the vessel into Chichester Harbour and following the ‘suspected fire’ procedures a Fire & Rescue Incident Officer was asked to attend but not the Rescue Engine and crew. The motor launch was beached off the Lifeboat Station and the F&R Officer was taken to the boat and certified that there was no fire, so ‘Sunny Spell’ was taken in tow to Sparkes Marina. A lifeboat crew member alerted the RNLI Lifeboat Station to a power boat with engine failure and with anxious crew on board. The duty officer contacted the Coastguard and it was agreed to launch the Atlantic 85 to go to a position W of Hayling Bay. The boat was located using the direction finding equipment and taken in tow for Sparkes Marina. As the Atlantic was just passing the Lifeboat Station the Coastguard called to request that the lifeboat go to assist a vessel with a fouled propeller drifting in the Nab Channel. The D-Class lifeboat was launched and took over the tow whilst the Atlantic 85 set off for the Nab Channel. The first casualty was duly delivered to Sparkes Marina and the D-Class returned to the station. Meanwhile the Atlantic 85 found the stranded boat called ‘Playing Hooky’ and took her in tow for Sparkes Marina where a diver had been organised to clear the propeller. Once there safely the Altantic 85 returned to the station. Mintues after returning from the previous service the Atlantic 85 was re-launched to go to assist a windsurfer reported in trouble just south of the ‘Inn on the Beach.’ When the lifeboat reached the area however they were informed that the windsurfer had made it back to the beach so they returned to the lifeboat station.